Here in Wisconsin each season of the year is distinct with its beauty and challenges. For a person who loves to be outside walking and hiking, winter can be harsh and downright cruel. The weather has no problem locking pour souls in cozy prison, along with their wanderlust. I don’t do well, having to stay in for too long. I try to venture out in the cold every so often. With my camera in glove-covered hand, and my body wrapped in numerous layers of clothing (including two scarfs, three long-sleeved shirts, one hat, and two hoods), I try to get out early to catch some peace and quiet along with an occasional glimpse of God in nature. 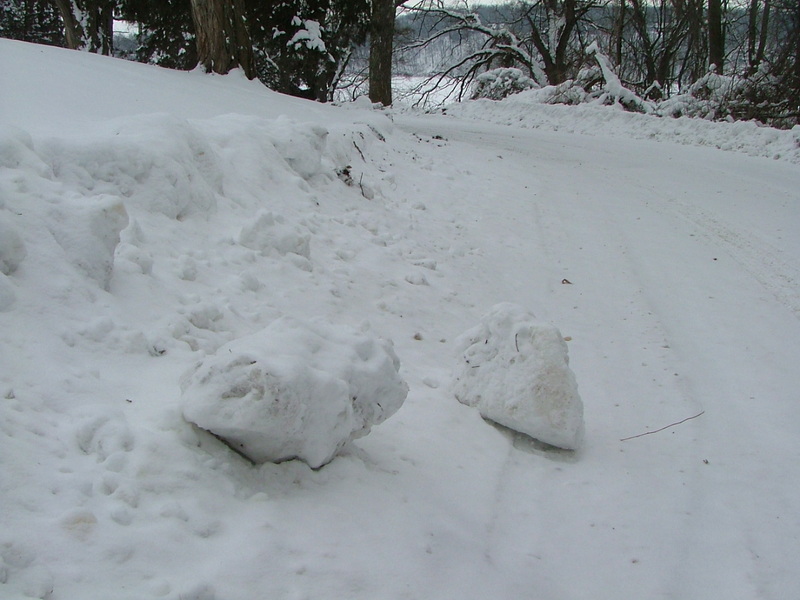 Just a couple of days ago, I came across some “snow-boulders” on my familiar path. They had fallen into the road and just lay there. They made me think. How often do I come across difficulties which have just rolled onto my path? How often do I take these things as immovable distractions? How often do I see them not for what they are, namely a hindrance for a season, but something that will block my path forever? “Father, help me to keep walking. Help me to find comfort in the fact that many seasons come and go and that along with seasons come many things that try to hinder me from finishing my walk. This entry was posted in Christian Poetry, Devotional and tagged cold, endurance, paths, perseverance, snow. Bookmark the permalink. Good prayer for me, too.